The Humours of Loughrea is a sprightly traditional Irish reel that will brighten any day! 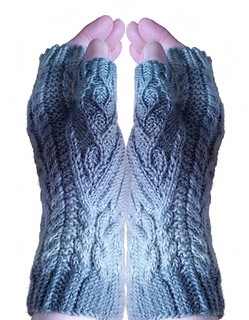 These beautifully cabled fingerless mitts match the Loughrea Socks and Loughrea Hat patterns. 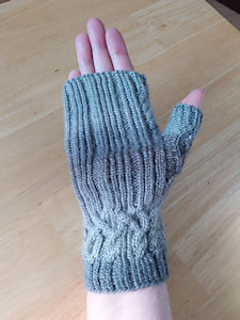 They are worked from the bottom up, beginning with twisted stitch ribbing. 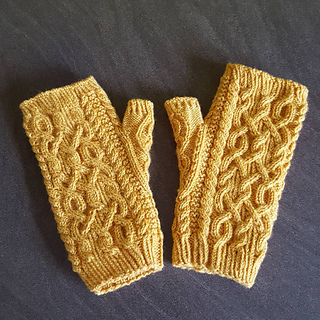 The cable cuff pattern is continued on the back of the mitt while the palm is worked in an irregular twisted stitch rib for a great fit. A tiny cable decorates the thumb gusset and thumb. 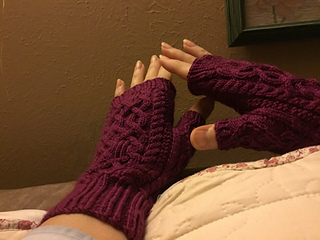 The pattern is formatted with side-by-side instructions for the right and left mitts for easy 2-at-a-time knitting, if desired. 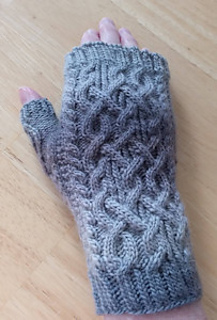 The cable stitch patterns are charted only. Many thanks to my marvelous test knitters: Ravellers celticgrace, contemax, cooksalot, dragonxser, faeriepaw, KateB660 and woollykim.